On October 23rd 2018, Clutch, a B2B research, ratings, and reviews firm in the heart of Washington D.C., released its annual list of the leading 224 companies from greater Asia and Africa countries: China, Japan, Vietnam, Indonesia, Philippines, Malaysia, Singapore, Taiwan, Bangladesh, Thailand, Pakistan, UAE, Israel, Jordan, Morocco, and South Africa. 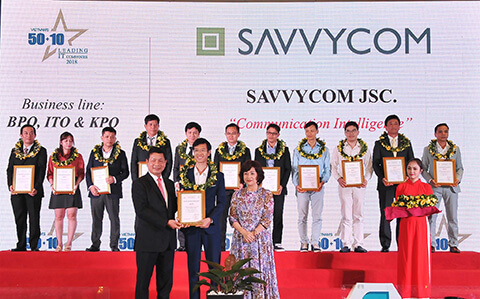 According to Clutch, a list of 27 market-leading B2B service providers was announced, consisting of Savvycom Software and other companies in Vietnam and Asia. Savvycom is named as one of the market leaders in the field of software development services. Savvycom is truly honoured to be announced as top 6 competitors among 27 B2B service providers in Vietnam (Clutch’s rankings on October 24). This is not the first time that Savvycom has made its appearance on the list of Clutch due to the impressive growth and significant achievements. One of the key success factors of Savvycom is the reliable, educated, senior and communicative team. The team were always updated with the cutting-edge technology and have a clear knowledge of programming. Savvycom has been constantly striving to fulfil the aim of becoming the most trusted partner to international companies and organizations, pursuing the global aim in the software and technology industry. After nearly 10 years of development, Savvycom has listed itself on Clutch’s Leading B2B Companies in Asia 2018 and Top 25 IT Outsourcing Companies in 2017. Ms Van Dang, CEO of Savvycom is also one of the speakers at TEDx and many other national and international events, listing herself at no.3 of Top 15 Global Leaders must watch in 2017 on Forbes. On this journey, we would like to express our warmest thank to our customers and partners for your business, your trust and the confidence you have placed in us.